We take a little break this week from our recap of our 2010 Midwest trip to drop back to some pictures from a much earlier trip. Back in 1998, we headed about as far east as you can drive on the North American continent, spending a week or so visiting much of New Brunswick, all of Prince Edward Island and a little corner of Nova Scotia, not to mention a big chunk of Quebec and some Maine stations, too. But as Radio Canada International wound down to its final days on the air in late June, we realized we’d never presented all the pictures from our one and only visit to its big antenna farm in Sackville, New Brunswick on a beautiful sunny June afternoon, and so it’s time to rectify that with a little visual tribute to a site that may not be around much longer. If you’re driving the Trans-Canada Highway (NB 2) heading southeast from Moncton toward the Nova Scotia line, you can’t possibly miss this site: it sits just off the east side of the highway south of Sackville proper, a few kilometers shy of the provincial line and almost right next to the turnoff to NB 16, the road that leads to the Confederation Bridge to Prince Edward Island. 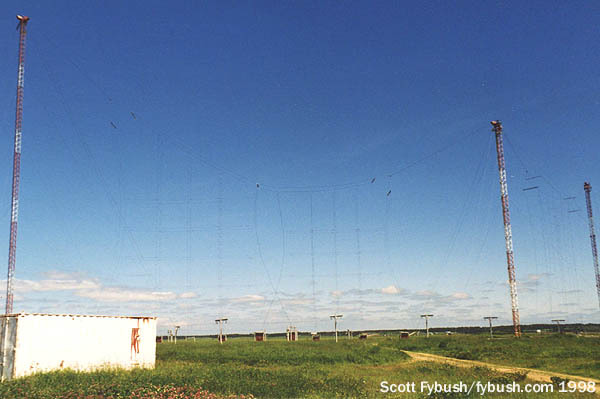 And if you were driving by in 1998, or at any time, really, in the last seven decades, you’d have been welcome inside for a comprehensive tour of what was once one of the most extensive shortwave installations in the free world. 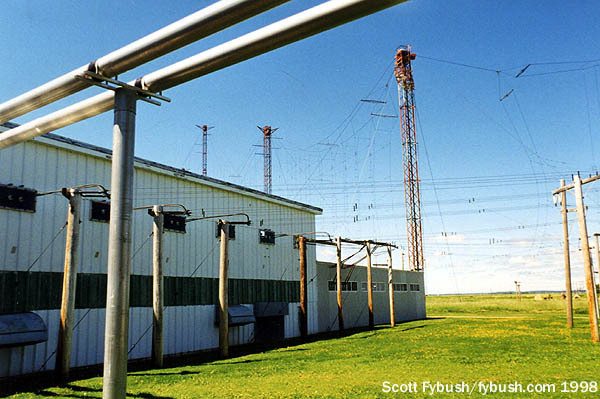 The history first, of course: on the edge of the Tantramar Marsh, the Sackville site was developed initially for medium-wave broadcasting. 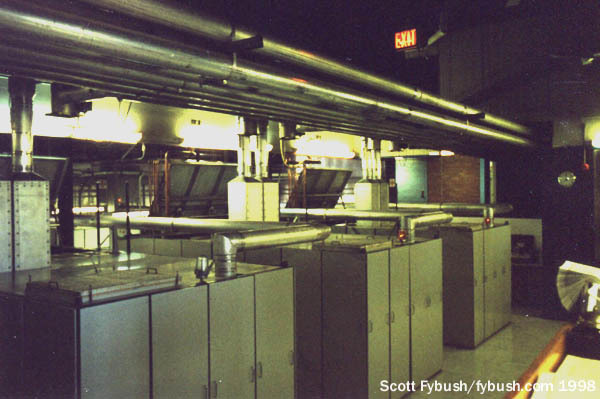 It opened in April 1939 as the transmitter facility for the CBC’s new Maritimes flagship. 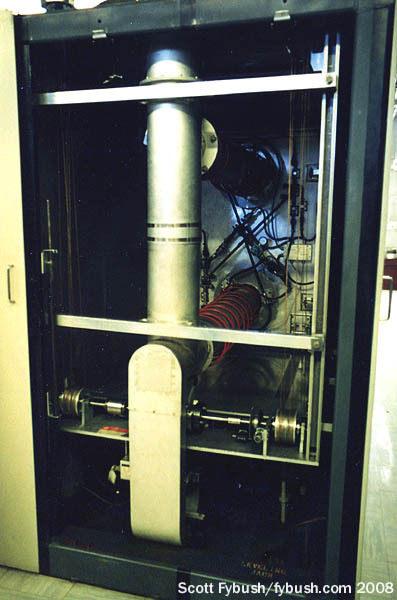 CBA (“A” for “Atlantic”) ran 50 kW, non-directional, on 1050 kc from a 460′ guyed tower that was reportedly one of the first vertical radiators in Canada. The new CBC signal (soon moved to 1070) was designed to cover nearly all of New Brunswick and Prince Edward Island as well as much of Nova Scotia, and it was perfectly situated for the purpose, with coverage aided by the salt water that flowed from the Bay of Fundy into the marsh. 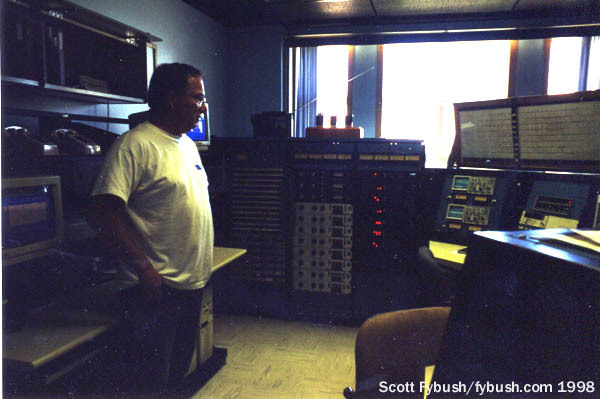 The Sackville site didn’t stay medium-wave-only for very long. Once World War II got underway, Canada wanted to add its voice to the international shortwave propaganda battle that was already raging across the Atlantic, and Sackville was the natural spot from which to fling a signal over the ocean to Europe and Africa. 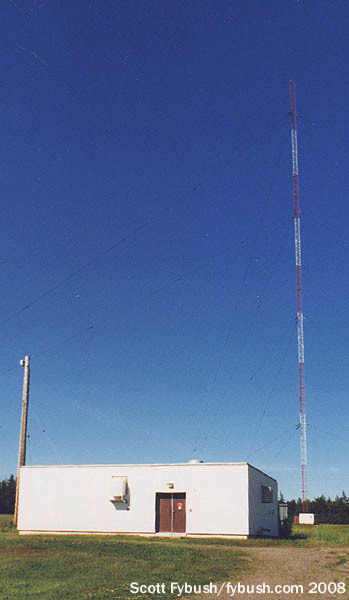 By 1944, the shortwave building was in place, complete with two RCA 50T transmitters carrying the “CBC International Service” to distant points. 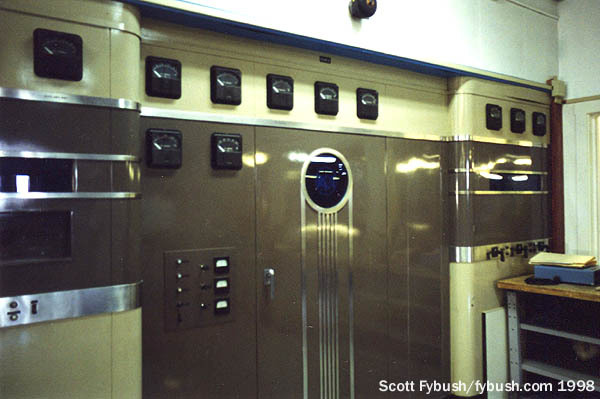 The central section of one of those transmitters still survives, the oldest remaining piece of the Sackville plant, complete with the RCA “meatball” logo in blue glass as the centerpiece of the Art Deco design. 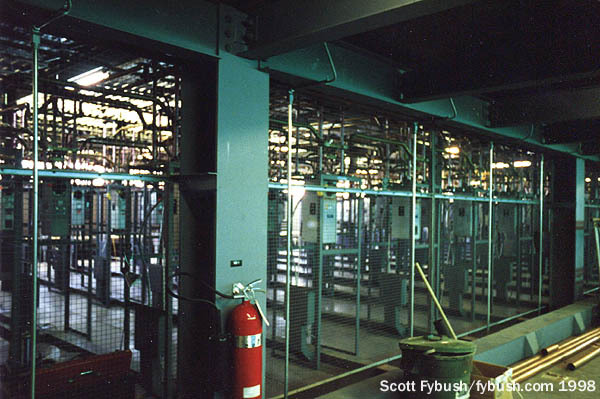 All that RF heads out to the world through a huge outbuilding that handles all the antenna and transmitter switching, most of it done by remote control from the control room we showed you at the top of the page. 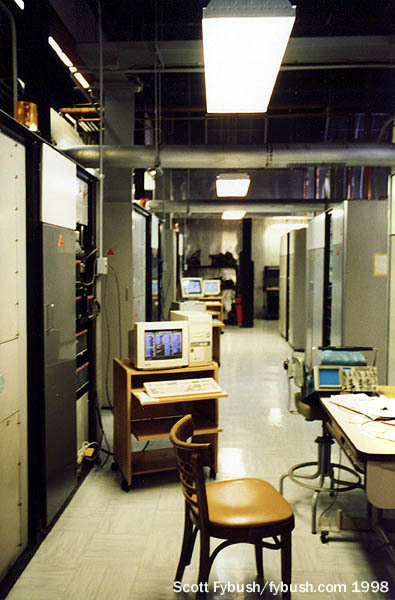 By the late 1990s, much of the airtime from these transmitters was being used for relays of other international broadcasters; in exchange for letting services such as Vatican Radio, China Radio International and Japan’s NHK use the Sackville transmitters, RCI was able to put its programming on additional transmitter sites that were better situated to serve the growing Asian and Pacific listening areas. From the switching building, all that RF headed out to a huge antenna field, and I’m not even going to pretend to fully understand the dark art of shortwave broadcast antenna design. Suffice it to say there are a lot of towers out here, supporting a lot of wire antennas that can serve a lot of different corners of the world. 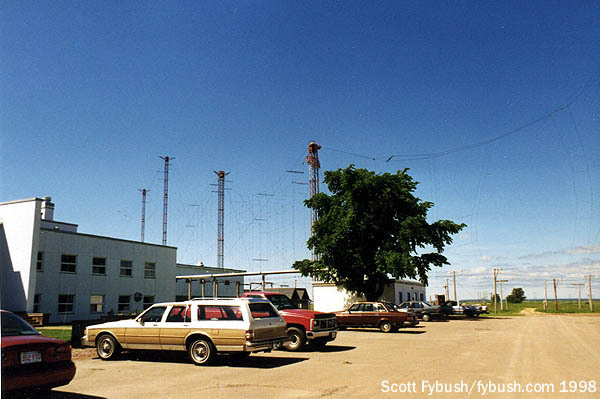 There’s not any medium-wave out here anymore, though: while it was the senior occupant of the site, CBA 1070 was displaced in 1968 to make room for more shortwave antennas. 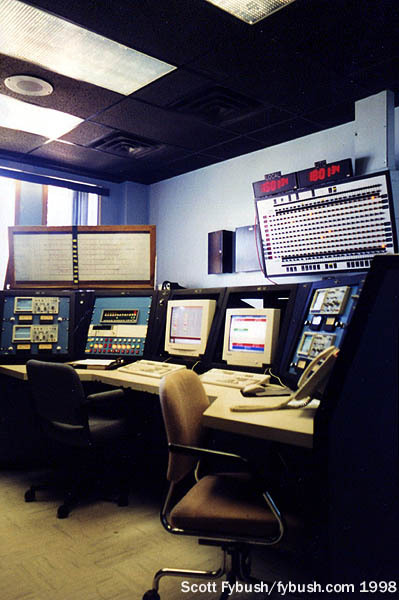 The new CBA mediumwave site was built about 25 km to the north on the outskirts of Moncton, becoming a more local signal to Moncton as additional new CBC Radio outlets went up in Fredericton and Saint John. And then it was shortwave’s turn to be sacrificed on the altar of budget cuts: when Canada’s government hit the CBC with a 10% overall budget cut in early 2012, CBC management decided to take out most of that budget by nearly eliminating Radio Canada International. 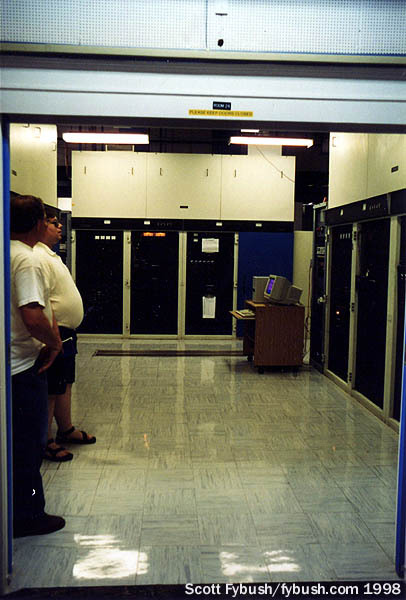 On June 26, RCI broadcast its last shortwave programming from Sackville, leaving behind only a skeleton on-line service from its Montreal studios. 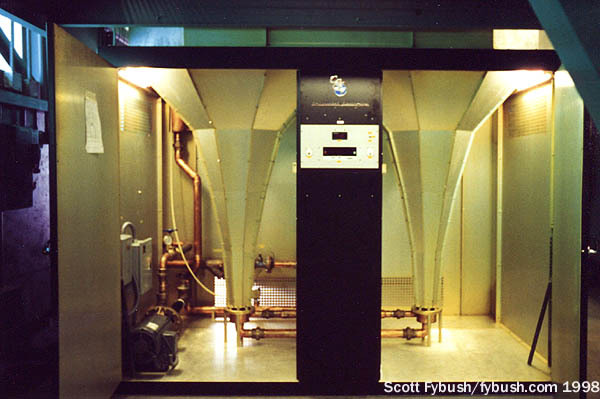 As we write this in early July, some services remain on the air from Sackville: a handful of international relays are still contracted to use the site until October, and the CBC’s Northern Quebec service (just a kilowatt on 9625 kHz) remains active until it can be replaced by FM relays in remote spots like Kuujjuaq and Puvirnituq. And after that, the future of the site is uncertain. 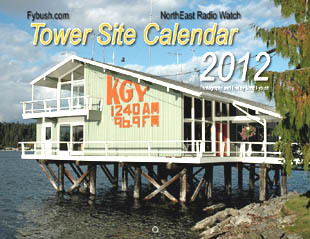 The CBC is attempting to sell it to other international broadcasters, and if those efforts fail, there’s some talk of using the land for a wind farm, but if nothing else comes up, the plan is apparently to raze the towers and the buildings, leaving nothing behind to mark the site that served so many listeners for so many decades. Thanks to the staff of RCI Sackville, circa 1998, for the tours! And don’t miss a big pile of new IDs next Wednesday, over at our sister site, TopHour.com! 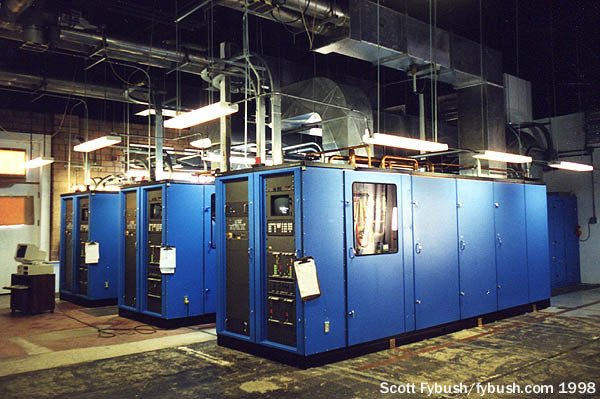 It is too bad to lose the shortwave service to budget cuts. Shortwave can reach around the world when other things can’t or you don’t have access to the Internet or Internet streaming. It also is good in natural disasters. I live on the far eastern coast of Maine and like WBZ1030 for news in the car or on the good radios in the house. I also like shortwave just to listen to sometimes to see what is out there.. Another thing is shortwave can be picked anywhere. It was and still is the only access to “free” information in parts of the world. 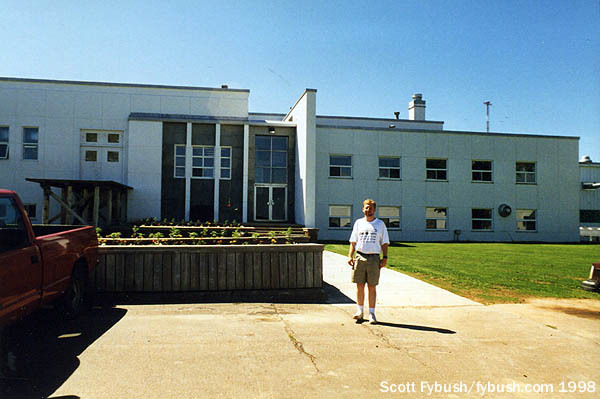 I’ll always remember my first sighting of the Sackville complex while on my way to visit cousins on PEI. Simply breathtaking!